Last edited by bigredharley; 08-18-2013 at 03:14 PM. Are the block centers embroidered? A longarmer would probably stitch around the edge of the embroidery and then stipple in the background? That is what I would do if I was quilting it myself on my sewing machine. I think a small white border and then the pink/purple would be lovely. yes, each one embroidered and no two the same. You did a very nice job on your embroidery - that's a lot of work!! I like your idea for the borders also. I think you will need more quilting than just stitching in the ditch. Stippling the background of each square would work. Lovely quilt!! There will be one happy little girl when she sees it!! I would outline the embroidery and then stipple around it. Before adding more pink and purple, I would give a place for the eyes to rest. A narrow border of white, then put the colored borders around it. Lovely little quilt. I concur with your thoughts on the border. There is going to be one happy little princess soon. If you are not condifident with stippling, and don't want to send it out, you could SID first. Echo once around the embroidered square 1/4" inside. Then echo around each block a few times. I think you would arrive at each block looking matted and framed. Can't tell from the pic how large the embroidered squares are. That would make a difference. Really beautifully done! Nice quilt! I, too, like the idea of a white border, then adding a pink/purple border to tie it all in. Lucky girl is the one who receives this as a gift. 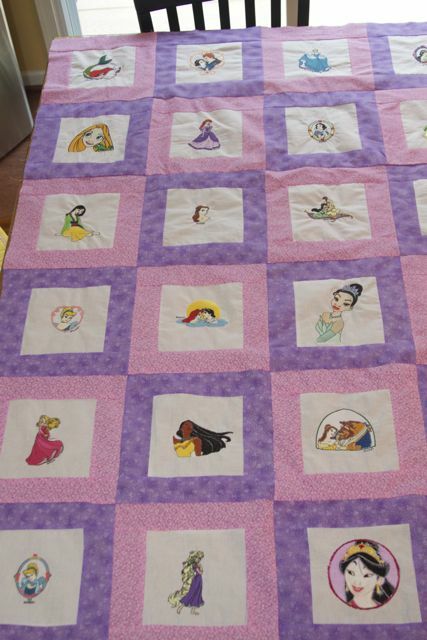 I would not use a print in the border, maybe for the backing you could use Disney princess fabric but for the front of this quilt stick with solids and let the embroidery be the big star. I'm thinking since this will be a "loved" quilt for a little girl I'm going to SITD - maybe some fancy stitches in the "frames". Too much fancy work would (in my humble opinion) take away from the princesses and really highlight there are so many different sizes of them. Some of the "heads" are not much more than 1" squares where some are 4". Just make sure you use a batting that will allow that much unquilted space. The packaging will tell you how far apart you can have unquilted. 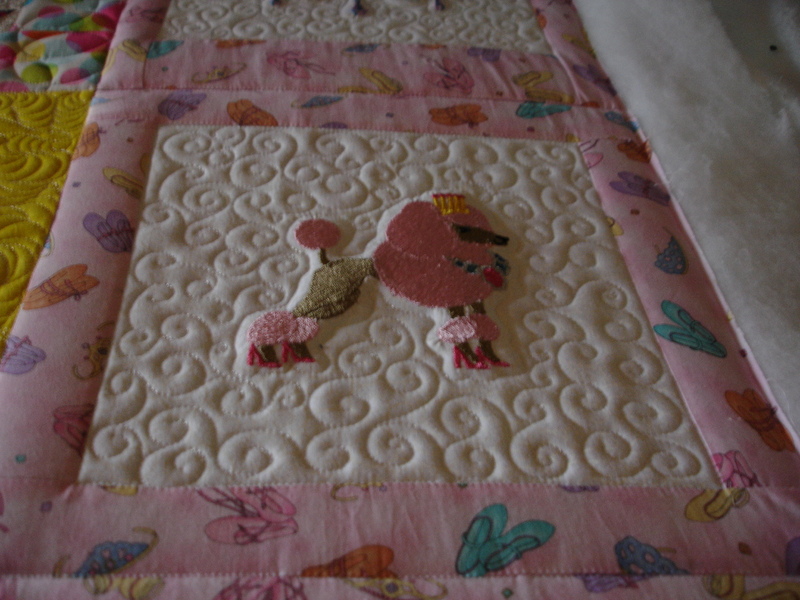 I think W&N is 10" If your blocks are 12" you will have to put some quilting inside the squares with the embroidery. My blocks are 6" for the white part. I think I'll be ok with w&n. and just do something in the "frames". Great point though, I wasn't thinking about that at all! You don't have to just stipple the background. There are lots of designs that can be used. And I like your idea for the borders being the plain fabrics. Let the embroidery shine. Wow ,you are so talented! What beautiful embroidery. I think the border needs a touch of black since you have a little black in almost every block. I would do something like narrow white, black, wide pink floral that has some yellow,black and white in it, and black binding.